Butterflies love the sweet scented flowers. Plants tolerate average to saturated soil moisture. Will work in rain gardens. I have one in my back yard (near the silky dogwood). leaves develop later in the spring than do most other plants as do the round flowers which are amazing and attract more insects than any other scrub I have except maybe the ninebark. no nesting in it yet but the plant is getting bigger and braches getting more horizontal. great plant. I keep birdbath at base to water frequently . 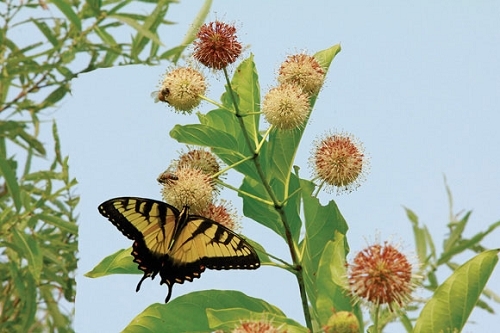 Q: Does buttonbush come as plant quart containers or just available from seed? A: We are growing plants, but they aren't quite ready yet. As soon as they are, we'll make them available online.